Think your relatives are hard to find? Bruce Abele and his brothers have been trying to track down the resting place of their father, Mannert Abele, for years. The elder Abele was commander of the U.S.S. Grunion, which disappeared while on patrol off the Aleutian Islands and was officially declared lost 64 years ago this week. Four years ago, a man who had heard about the Grunion's disappearance e-mailed Bruce the links to several Grunion Web sites. John Abele contacted the man, Yutaka Iwasaki, who translated and sent him a report written in the 1960s by a Japanese military officer who served in the Aleutians. A maritime magazine had recently reprinted the report. 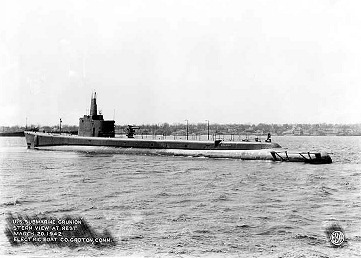 It described a confrontation between a U.S. submarine and the officer's freighter, the Kano Maru, on July 31, 1942, about 10 miles northeast of Kiska — the Grunion's patrol area. The Abeles hired a marine survey firm to scan the ocean floor this summer. The brothers are reluctant to say they've found their father, but are sending down a remote-controlled underwater camera next summer to take a closer look at the vessel. The Abeles are not alone in their search, and maintain a blog to keep other Grunion family members apprised of their progress.